Philippe came out to the car park to greet us and helped carry our luggage into the guesthouse. He saw us settled into our rooms and then insisted on feeding us a lovely dinner of fresh baked bread, homemade soup (his specialty) and a wonderful salad of fresh greens and tomato, followed by a sumptuous cheese board with a selection as generous as most deli's boast. We sipped a nice mellow wine with our cheese and fresh bread as we visited with our host and new friend. Others had written on the International Innkeeper's Exchange that Philippe was "very tall" or "the very tall Philippe Papadimitriou" and they were not exaggerating! The good news is he comes with a dose of charm and gracious manner to match his towering height. Philippe is an interesting man, very witty and full of good humor. 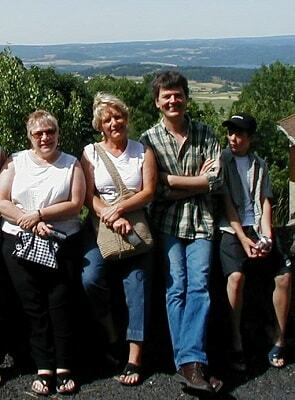 Being innkeeper's ourselves, Judy and I were both amazed at how he was able to remain so good natured all the time. When we finally realized that he was serious about not having any additional help around L'Etoile we were even more impressed by his good humor. He hustles about the five story guesthouse, vacuuming, cleaning bathrooms, changing linens, washing laundry, hanging it on the line to dry and - get this ladies - ironing sheets! And all the while he sings and whistles and smiles and acts thrilled to see the next onslaught of guests arriving in the afternoon. Somehow he even manages to bake fresh bread every day, prepare delicious homemade soup for each evenings' dinner and plan and prepare an amazing multi-course evening meal designed for the hungry hikers and cyclists who frequent his guesthouse. 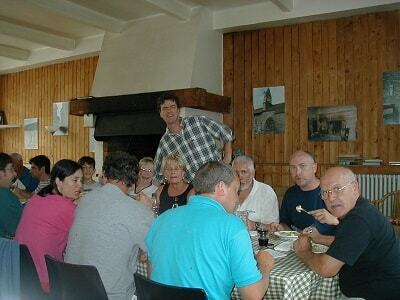 Our stay with Philippe was as warm welcoming as being with friends you wear like a pair of old shoes. He is unpretentious, gracious and mellow, and abovconcerned that each guest is treated li his only guest. We were four of the nine to 24 guests he hosted each night during the six nights we were there. Naturally we helped in the kitchen, setting the table, helping serve and doing dishes when someone else hadn't already beat us to the punch ! But Philippe did all the cooking and the majority of the work. A few guests were happy to help out - usually attractive young women who were obviously smitten by this handsome, charming and clearly overworked man! Sometimes we thought he had a pretty smooth racket going as he never seemed to suffer from loneliness when it came to clearing up after a meal. Guests quickly catch on that this is his dinner bell and they begin to wander into the dining room and find their places. Language is no barrier once the food begins to come. We were among Belgians and French, speaking Flemish, French and a few words of English but we managed to laugh and converse and enjoy camaraderie uncommon in American culture. At the very least we were able to learn the names of our companions at the table each evening and with those who were willing to venture conversation in English we were able to learn much about their families, jobs and lives. I 've always been ashamed that I didn't speak a foreign language and never more than when I learned that these Belgians learned English from watching Sesame Street on television! 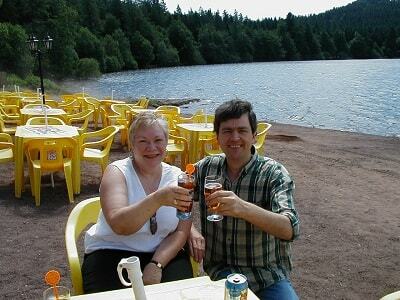 Jack and Lisette were an interesting couple who spoke a little English but were very shy and quiet. They come to Philippe every year and spend a week in the quiet and solitude of L'Etoile. 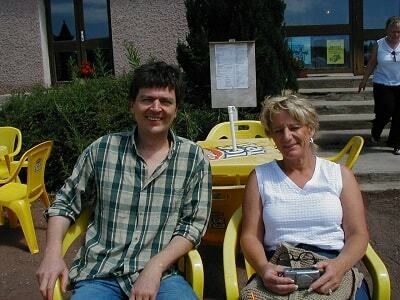 One day Philippe suggested we go to Le Puy en Velay with him to buy food supplies. We eagerly accepted his offer and then he told us Jack and Lisette would be coming as well. We were delighted with the opportunity to get more well acquainted with them. So, the morning arrived and we all rushed around helping Philippe clean and prepare for the evening meal so that we could be gone until late in the day. Around 10 a.m. we all piled into the van and started out for our shopping trip to the city. After what seemed a short time Philippe wheeled the van off the road and into a Medieval Village called Pradelles. We stopped the van and emerged onto cobblestones amidst perfectly maintained ancient stone houses arranged along spotlessly clean streets. It always stuck us that there must not be any garbage in France as the villages were so tidy and neat. One never saw litter, graffiti or any signs of disrespect or economic hardship. Yet inquiries produced the same general feeling as we have in our small rural towns in America - that there are privileged to enjoy this special event. Seated on the outside veranda overlooking the valley we felt like we could see the other side of the world. Birds chorused and flitted from tree to tree, cattle grazed peacefully on the opposite hillside, a cat lazed in the sun on a backyard patio just below our vantage point and the food was too delicious to describe. Philippe abstained from the wine so he could drive us safely home on these narrow roads and let us enjoy the afternoon eating and drinking to our hearts content. We met a German couple at the next table and enjoyed talking to their daughter who was visiting them from Munich where she is a television producer. They had retired to a small village down the canyon from Loubaresse and felt quite settled in to their French surroundings. Françoise's daughter stopped by and the German's were highly excited to see her. It seems she is famous in the area for her goat cheese and they were most anxious to get another supply. Loubaresse is a 12th Century village that has been restored and is nicely maintained. We would have liked to take more time to wander into the patisserie and the boulangerie and other shops but we lingered so long over our lunch that we had to hurry our departure. We still had another stop to make before we could return to L'Etoile. Philippe had given a Belgian hiker named Els a ride to the river so she could swim for the afternoon and we had to collect her on the return trip. Once we had Els in the van we headed for the Monastery Notre Dame des Neiges (Our Lady of Snow) at La Bastide Puylaurent and a trip through the winery. This was the final stop on our tour for that day and it was very interesting. Else returned to La Bastide with us and decided to stay a few days at L'Etoile. She traded a campsite in Philippe's backyard for some labor in the kitchen and the laundry. Philippe was happy for the help and the companyit seemed and Els, who was over 6' tall and very striking, seemed very happy with her bargain as she had been hiking alone for many days. "Grandma, I just want to go back to Philippe's and wake up in the morning and eat bread!" Those were the words of my 12-year-old grandson shortly after we returned from our near perfect vacation in France. The only thing separating near perfect from perfect was that we didn't spend the entire time at L'Etoile (the star) in La Bastide-Puylaurent with our dear friend Philippe Papadimitriou. 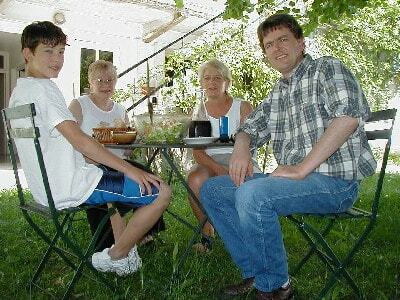 Naturally I was a little apprehensive about making a trip to an unknown place in a rural part of France with my good friend and fellow innkeeper (Riverside School House B&B), Judy Jacobs, and my 12-year-old grandson Tyler, and planning to spend the entire two weeks in one spot. I didn't know Philippe personally, although we had been e-mailing for over a year and a half, and my friends and family thought I was taking a big risk to arrange an innkeeper's exchange with this fellow I knew nothing about. Originally I had planned to fly from Oregon to Paris and take the train to La Bastide but I was persuaded by others to rent a car so I would have a mechanism for escape if need be. It wouldn't have been necessary at all in retrospect.